In our mind, Karen State is symbolized by the purity of a fresh, white rose. The “thorns” of the enemy cannot destroy its loveliness. The simple and generous Karen people of Karen State are like a golden field of grain, ripe for the harvest. They’ve been matured to perfection by storms of adversity and sorrow. Ancient hopes and legends have prepared them to receive their younger brothers and sisters who come to bring them the Book. There’s no doubt about it: preaching the gospel in Karen State is dangerous. But we are commissioned to “Go … and teach all nations….” This includes Karen State. Our dream? –that the “Land with No Darkness” will become a land flooded with the light of the Glory of the Lord; that the Karens of Karen State will hear and embrace the gospel; that their land will become a place like ancient Israel was meant to be– a shining light from the mountaintops; and that their youth will become a mighty, joyful army who will go forth to proclaim that Jesus is coming again! Karen Outreach is a faith-based, self-supporting Seventh-Day Adventist ministry. Karen Outreach are committed to share the love of God as revealed in the Bible and to spread the message of salvation. Karen Outreach is founded on the principles of charity, benevolence, and justice for all. We are committed to charity demonstrated through loving acts of service for those who are oppressed and outcast. We aim to serve without prejudice and without boundaries, believing in equality, democracy, and religious freedom for all. We believe in restoration and rebuilding of broken lives, hearts, and relationships through the power of God's love. We stand for medical services and education to be within the reach of all. We stand for darkness and evil to be fought against with love and firmness. We see it our duty to stand firmly against wickedness, crying out against the exploitation of women, children, the aged, and the afflicted. We believe that if we stand silently in the face of evil and corruption, we then become partakers of those very evils. We purpose that those who suffer in poverty should not be degraded and taken advantage of, but lifted up and ministered unto. Karen Outreach focuses on acts of service in behalf of the Karen people of Thailand and Burma, but we minister to anyone in need regardless of race, gender, or religion, as God is not a respecter of persons. "The good news is that when the world is a bitter place, heaven is a bright hope. Although we would end the suffering that we can, the greatest comfort and healing comes from sharing the blessed hope. The most effective way to hasten the end of all the suffering is to hasten the return of our Lord. Until then, all we can do is patch the hurting places. When He comes, everything will be made new." "Who is Karen? ", people would ask us, as if "Karen" were the name of someone whom they had not yet met, while recently holding a booth in behalf of Karen Outreach at an ASI convention. It was evident that few have heard about the Karen people. Despite their huge plight and amazing story, they are truly a little-heard of ethnicity. The world as a general have been strangely silent on behalf of their cause, while the Karen have been agonizing to hold their ground during the longest civil war in history, going on 70 years long. One can only speculate as to the reasons of this strange silence. Some helpful facts may or may not include Burma's status as the second largest exporter of heroin and morphine in the world; the Karen land's coveted value of precious metal, gems, gold, and natural resources richly embedded within its borders; Myanmar/ Burma's known hydro power project plans in Karen State, in alias with super powers, such as multi-billion dollar dam projects; Myanmar/ Burma's profitability as a buyer of lethal weapons of warfare, used to suppress and subdue the cries for democracy from the various ethnic groups; and the "hush" that the trade of human trafficking and slave labor mandates in regards to the darker issues within the nation. In the meantime, the Karen need encouragement and advocates. Eric B. Hare, a pioneer missionary to the Karen people, lived among the Karen for 20 years until the second world war. His work is quite well-known to those who have read his books. 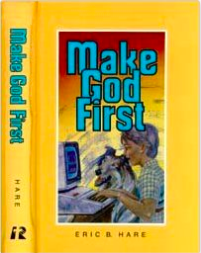 When we first came to Lay Klo Yaw, the little mission school in Karen State, Burma, we saw a sign saying "Made God First" (meaning to say "Make God First") in honor of Eric B. Hare and his life. 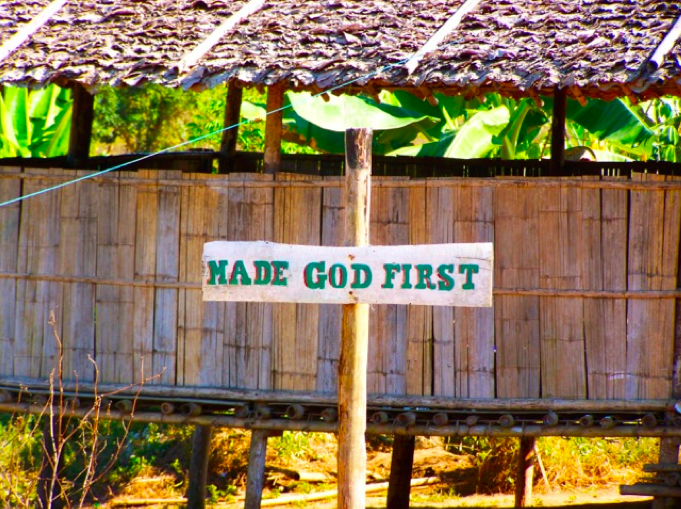 The sign was inspired from his devotional book "Make God First", which contained some stories from his experiences living among the Karen in Burma. The sign made it obvious that this school also desired to follow his example, making God first. Way back in October 1915, The Hares, both nurses, arrived in Burma from Australia. First they were asked to live in Yangon in order to study the S'gaw Karen language. Then in May 1916, they moved to the new Karen Mission Station at Kamamaung, Ohn Daw, where Mary Gibbs had already started a dispensary. There, Eric B. Hare became fondly known as "Dr. Rabbit" by his patients. He also opened a school which later became an important training centre, and formed a jungle brass band for preaching in villages. After nearly twenty years of service in Myanmar, he was called to the Sabbath School Department in the Pacific Union Conference, and later in the General Conference. And in that capacity, he traveled widely in America and other countries, speaking at camp meetings and other gatherings. Pastor and Mrs. Hare also contributed to the work in Myanmar through one of their sons, Leonard, who served there for several years after the Second World War. Below are pictures of the sign, and of some of Eric B. Hare's books.